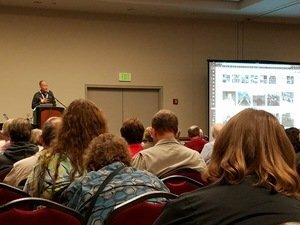 In case you were unaware, RootsTech 2017- the largest family history conference in the world – was last week (Feb. 8-11). Over the next couple of weeks, we’ll have some in-depth posts about new and improved ways to capture and preserve personal and family stories and narratives. In the meantime, here’s the high level overview of what we loved at RootsTech 2017. Classes were informative and well attended. 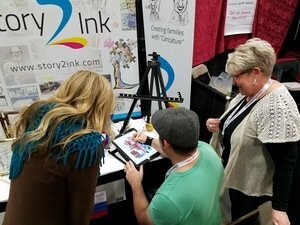 RootsTech has 3 days of classes (the first day is the Innovator Summit – more on that in a minute) that revolve around genealogy and family history. Classes run the entire spectrum: how to start; LDS-specific; researching ancestors using new technology, like DNA testing; how to use social media for genealogy; and on and on. We attended several classes, all related to storytelling and preserving memories in one way or another, and found them to all be excellent. Speakers submit their topics several months prior and are chosen based on an undisclosed formula. All were knowledgeable and accessible. For a complete listing of what was offered this year, click here. If family history is your thing, there is a lot of instruction at RootsTech. Each morning there is a keynote speaker who lectures on some aspect of family history. These are not always “genealogy experts.” In fact, they are more often pop culture icons. This year, there were 7 keynote speakers, 5 from outside the genealogy space. All talked about some aspect of family history, genealogy research or connections to their families/ancestors in some way or another. Buddy Valastro – the “Cake Boss” – spoke about how food joins families together. Think about it: whenever there is a family event, there has to be (good) food, doesn’t there? It’s an unwritten rule, and it seems to span cultures and time. Actor/director LeVar Burton gave a moving talk about family history. He referenced the book and movie Roots (by Alex Haley) several times. Remember he played the young Kunta Kinte in the movie. At the conclusion of his remarks, he was presented with his family’s history. This was a gift given by Thom Reed of FamilySearch, and Burton was very emotional as it was given to him. Liz Wiseman also spoke at the Innovators Summit. She spoke of how “learning beats knowing” in life and work, and pulled from her book, Rookie Smarts, on several occasions. It was fitting for her to speak in this setting as she has documented so much of what truly innovates in business. This Saturday event is LDS-specific and draws an enormous crowd of youth and adults. Speakers included President Russell M. Nelson and his wife Wendy, Hank Smith, Sheri Dew and others. All spoke of the importance of families and how to strengthen them. View in a tree or as a timeline. Click on the event for more details. Twile is a graphic timeline and family tree platform that shows all the important happenings in your life. It also adds key dates and events from family members. Data can be imported from various sources, including FamilySearch and gedcom files. It integrates with Facebook so you can import specific things from there, too. Tell your story using Pass it Down. 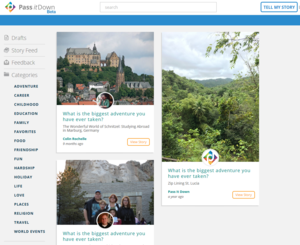 ou can add and edit life events and share with family. And Twile recently announced that is is now FREE! Photos are a critical part of family narratives. Now that everyone has a camera in their pocket, photos are even more important. The talent displayed by the Story2Ink artists was amazing. This is one of the more unique products we found. Story2Ink takes pictures and caricature-izes them to tell stories. They can even do storyboards (think comic books) to tell stories. This is great if you want to add something different to your printed or digital history book, so we look forward to working with them on our custom books. Like I said, we’ll be reviewing many of these in the coming weeks, so stay tuned for more detailed information. 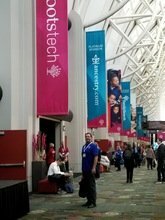 Between the education, information and energy found at this giant conference, RootsTech is a great event to attend. If you haven’t yet had the opportunity, you should plan on going next year. There is so much to learn and see there, it’s well worth the price of admission. Family Search Memories vs. Google Photos. Is it even a competition?